These notes are taken from an article in the Brazilian monthly Catolicismo (November 1976) summarizing a matter published in the Belgian periodical Mysterium Fidei (n. 33, July 1976). I am just selecting some parts of the summary that I consider opportune for TIA readers. Is this old news? The dates of the publications are obviously old, but since the subject is doctrinal and historical, it does not lose its relevance. When the question of papal infallibility proclaimed at Vatican Council I is studied in detail (here and here), we see that when it comes to the exercise of the personal teaching of a Pope, infallibility does not cover all pontifical acts. It is for this reason that many theologians study the various cases of a scandalous Pope, a heretical Pope or a schismatic Pope… Actually the cases where personal papal infallibility is involved are rare. Instead, some historical examples show how Popes erred in the past and thus illustrate that they can be considered fallible in their personal teachings and actions. Pope John XXII defended that after death, the souls of the elect would await the resurrection of the flesh and the Final Judgment before enjoying the beatific vision of God. Similarly, he defended that neither the devils nor the condemned souls would suffer eternal punishment in Hell before that day. He presented these singular opinions in three sermons delivered respectively on November 1, 1331, December 15, 1331 and January 5, 1332. Such opinions seemed to have some base on Scriptures, but the whole of Tradition was opposed to them, even though most of the revealed doctrines regarding this topic had not yet been defined at that time. Nonetheless, based on the opinions of several theologians interpreting the Church Doctors, the Sovereign Pontiff insisted in his opinions, going as far as to publish a book to support that thesis. Since the opposition of the faithful was becoming very strong, the King of France asked the theologians of the University of Paris and the religious Orders to study the subject. They reached a conclusion contrary to that of the Pope. In the consistory of January 3, 1334, John XXII declared that he was disposed to retract his thesis if it were proved to be against the common doctrine of the Church. In fact, he retracted his opinion on December 3, 1334, the eve of his death. In the presence of the College of Cardinals, he signed the Bull Ne super his by which he officially revoked the doctrine he had upheld. 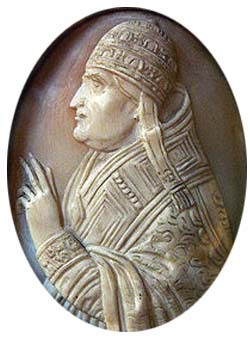 His successor, Benedict XII, published his predecessor’s Bull of apology. Some years later, he officially defined, as a truth of Faith, the opinion contrary to that of John XXII. This historic fact makes it evident that a Pope is not infallible in all of his teachings. In the hymns reformed by humanist Cardinal Zacharias Ferreti, the Virgin Mary was called “felix dea, deorum maxima, nympha candidissima” [o happy goddess, o greatest among the gods, o most beautiful nymph]. Personages from pagan mythology such as Bacchus and Venus were also introduced into the liturgy. 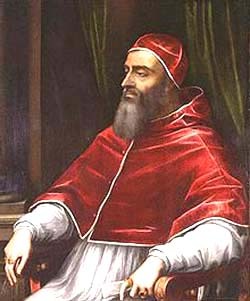 It is understandable that St. Pius V, when he brought to a close the abuses that had infiltrated the celebration of the Holy Mass and the liturgical offices, did not refer to that unprecedented papal document of Clement VII. He simply treated it as non-existent. 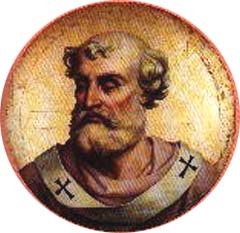 In a semblance of a trial, Pope Stephen VI commanded the body of Pope Formosus, who had died nine months earlier, to be disinterred. The decaying cadaver was then dressed in pontifical vestments, set on a throne and submitted to an intense interrogation. At the side of Formosus’ corpse a deacon stood to respond on behalf of him. At its conclusion, Stephen VI gave a speech insulting the remains of Formosus and declaring his election null. He also declared all the consecrations of Bishops and acts made by Formosus to be invalid, and ordered the three fingers of Formosus’ right hand used in consecrations to be severed. The people of Rome, highly indignant, imprisoned Stephen VI some time later, gave him monk’s garb, and strangled him in prison. The successors of Stephen VI made reparation for the abuses against Pope Formosus performed at the “cadaver synod”. However, Sergius III (904-911), a cruel, mundane and dissolute man who gave rise to “pornocracy,” reissued the measures against the ordinations and consecrations of the Bishops made by Formosus, obliging the Bishops and priests - under penalty of exile, prison or excommunication - to be re-consecrated and re-ordained. Robert Grosseteste, the English Bishop of Lincoln (1235-1253), was an erudite, pious and zealous man who sought to reform his clergy. He turned his attention in particular toward those who had received high appointments through special privileges and did not fulfill their obligations. 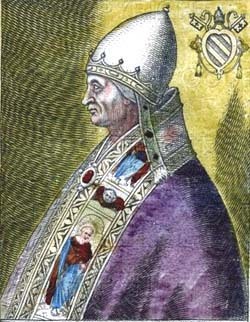 Pope Innocent IV, however, did not hesitate to name one of his nephews to be a Canon in the Chapter of the Cathedral of Lincoln, ordering the Bishop to install his nephew without delay. “Precisely because of the obedience that binds me and for the love of my union with the Holy See in the Body of Christ, as an obedient son, I disobey, I contradict, I rebel. I resist your command. You cannot take action against me, for my every word and act is not rebellion but the filial honor due by God's Commandment regarding father and mother. Furious, Innocent IV wanted to punish Bishop Grosseteste, but his advisors dissuaded him because it would be a scandal for all Christendom. “To show himself faithful as the dispenser of the Faith” (1 Cor 4:1-2). Bishops and Popes, as successors of the Apostles and of the Prince of the Apostles, have a mission determined by the divine constitution of the Church. She must lead men to God, so that they may unite themselves with the Creator without impediments. The Church can never lose sight of this strictly religious and supernatural goal. The way the Church accomplishes this supernatural goal is indicated by Revelation itself. Hence, the obligation to follow Tradition, according to the precept of St. Paul given to the Galatians: “Even if we or an Angel from Heaven were to preach a Gospel to you different from what we have preached to you, let him be anathema” (1:8). 2. Ludwig Pastor, Istoria dei Papi, Desclée de Brouwer, vol. 4, p. 418. 3. Summa theologica, 2,2, q. 104, a. 5. 4. Mangenot Vacant and Michel Amant, Dictionnaire de Théologie Catholique, vol 14. columns 1918-1921. 5. “Robert Grosseteste: Pillar of the Papacy", Christian Order, vol. 16, n. 12, December 1975, col. 722-723. 6. Pius XII, Allocution of March 6, 1956. .
How Should a Catholic Act before Bad Popes?